Other students (many of whom were already skilled in other internal and external systems they had learned in Hong Kong) were learning Fu style xing yi, ba gua, Chen, Fu and Yang styles of tai chi at this time, so I had the opportunity to discuss and observe these styles (each student was taught one-one-one while the others practiced). 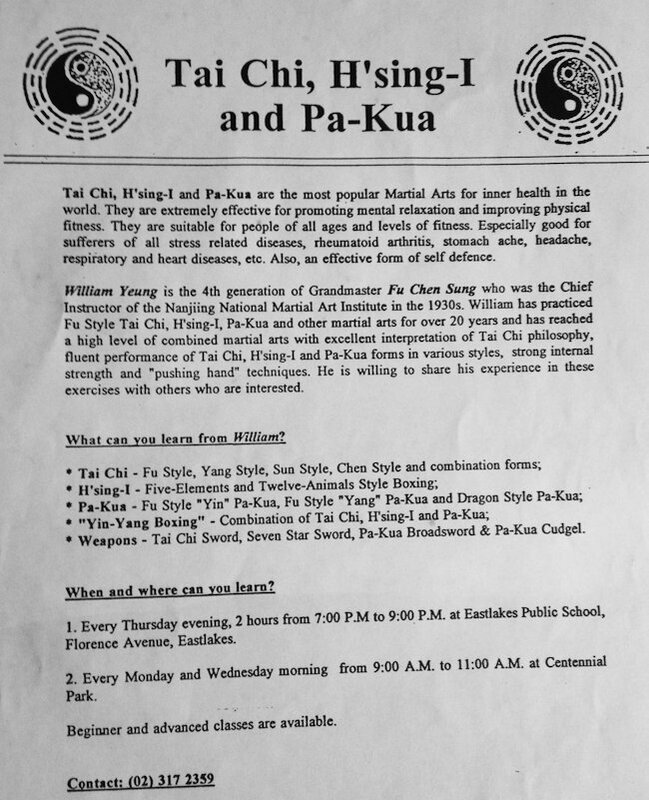 William's class flyer from the early 1990s. I went travelling to find a good tai chi teacher and was very happy to discover this school in Sydney. After leaving Sydney, I visited many schools in my travels, joining classes in Brisbane (Chen style), Canberra (Yang style), London (Yang style), and New York (Wu, Chen, and Yang styles). I attended some seminars at Bow Sim Mark's school in Boston, and some private lessons with Liang Qiang Ya in San Francisco. Today I mainly practice qigong. BA, University of New South Wales 2005. MProfAcc, University of New South Wales 2007. My other interests include science fiction, film, and Chinese philosophy and medicine. This site uses the nginx webserver running on openbsd. Website copyright 2007-2017 by Brett Mahar, unless otherwise indicated.